The Egg Pinball (エッグピンボール Eggupinbōru) is the sixth boss of Sonic Advance 3, and is fought in Cyber Track's boss Act. 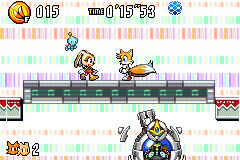 Perhaps one of the more favored bosses in Sonic Advance 3, the player is basically playing a game of dodgeball against Eggman, who is piloting a mech that fans have come to call the "Cyber Egg Turret". Eggman is below the player, moving back and forth, launching blue crystal balls at the player, which ricochet when they make contact with a wall. The platforms on the sides of the arena will fall into a pit if stood upon for too long. To beat this boss, the player must successfully knock Eggman's balls back at him by jumping into or attacking them (turning them orange). As Eggman takes more hits, he will fire more frequently, which can become chaotic as the balls move faster. Gemerl is just above Eggman's cockpit. Once the machine is hit with 8 balls (6 on Easy), the boss goes down, and the player can move on to the final zone, Chaos Angel.